The Fizik R5 road cycling shoe is the product of an Italian brand. The shoe is specially designed to offer a great cycling experience. It’s a high-end cycling shoe with a great timeless look. We love the R5, that’s why we also picked it in our top 5 beginner cycling shoes article. The Fizik R5 road cycling shoe is a fine tune fit type shoe designed especially for cycling purpose, with carbon reinforced in addition to microtex. Like most of the performance shoes, the sole is not completely of full carbon instead, it is made of carbon injected compound. The Presence of microtex on the upper portion of the shoe makes it durable and comfortable at the same time. It gives strength to the shoe construction and makes it a consistent fit. The show has an over curve shape, designed in order to maximize comfort to the foot. This is because the asymmetrical construction of the shoe designed according to the foot anatomy. The compound nylon outsole is able to ensure efficiency in pedaling in addition to providing comfort. It is available in sizes ranging from 36-47 EU. The 42.5 EU version weighs about 9 ounces. Besides white and black, a coral and black, dark grey and black, white and light grey, black and red, black and pink flue are the other color options available. The Fizik R5 road cycling shoe is made for maximizing its efficiency on paved roads, be it of smoothest tarmac or on more demanding rough cobbles. Before buying any product, it is important to take a thorough glance at the pros and cons. Since it is quite disappointing to order and then return the product. Below are the pros and cons of Fizik R5 road cycling shoe to give you a kind of analysis on the product. Check and decide whether you think this cycling shoe is a ‘yes’ or ‘no’. The Fizik R5 road cycling shoes managed to bag an impressive number of advantages. 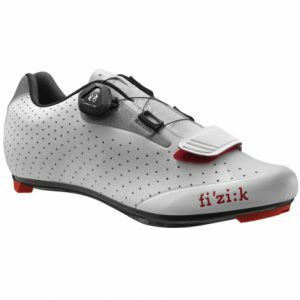 We can conclude that Fizik R5 road cycling shoe is ideal for resisting water and when its cold out. However, if you want to get a very stiff performance shoe you should continue your search. Next Post:Heard About The Gavin Velo Road Bike Cycling Shoes?